Grilled cheese sandwiches bring back the memory of staying home from school, sick on the couch with a potentially fatal math-class-hating fever, watching my grandma’s favorite soap opera, and eating white bread and yellow cheesefood-slice filled grilled cheeses dipped in Campbell’s tomato soup. All these years later, now with my own kids stuck on the couch, there’s still something super comforting about the crusty concoction. As time has gone by though my grilled cheese obsession has managed to mature a bit since my elementary, middle, and high school days. 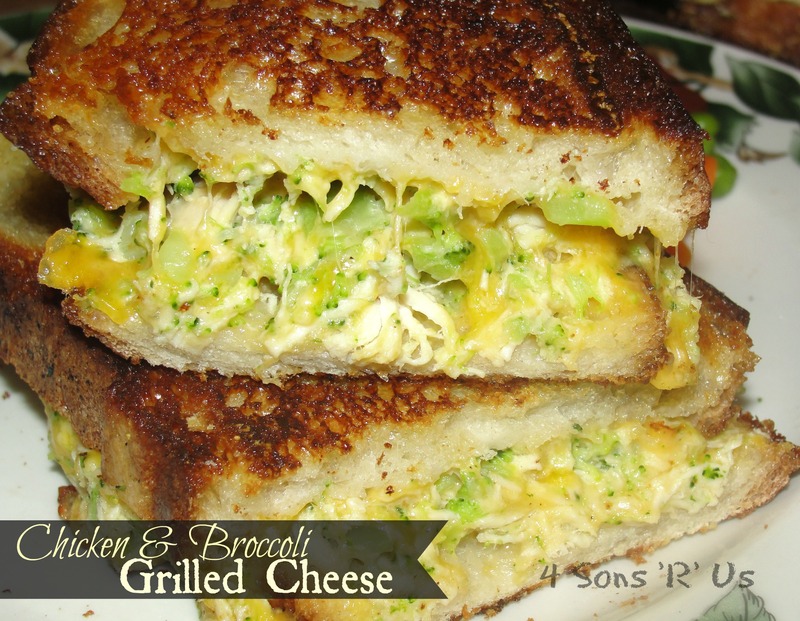 Here’s out latest version of what the sons call a ‘grown-up’ grilled cheese. All the familiar ooey,gooey cheesy bits you love, but filled with real ingredients and flavors fit for any sophisticated adult palate. I’m lucky the sons love them too, even with the addition of veggies. Yes sons, your Mom can and will attempt to try and ruin one of your favorite ‘classics’ by making it a tad bit healthier. 1. In a medium bowl, combine the chicken, broccoli, cheddar, Parmesan, garlic powder, mayonnaise, Dijon mustard, and salt & pepper. 2. Divide the mixture evenly between four of the bread slices, and top with another slice of bread. 3. Melt butter in a pan over medium-low heat. 4. Cook the sandwiches for about 3-4 minutes per side, or until golden brown and the cheese has melted. Covering the pan with a lid during cooking will help the inside get all warm and gooey before the bread gets too browned.